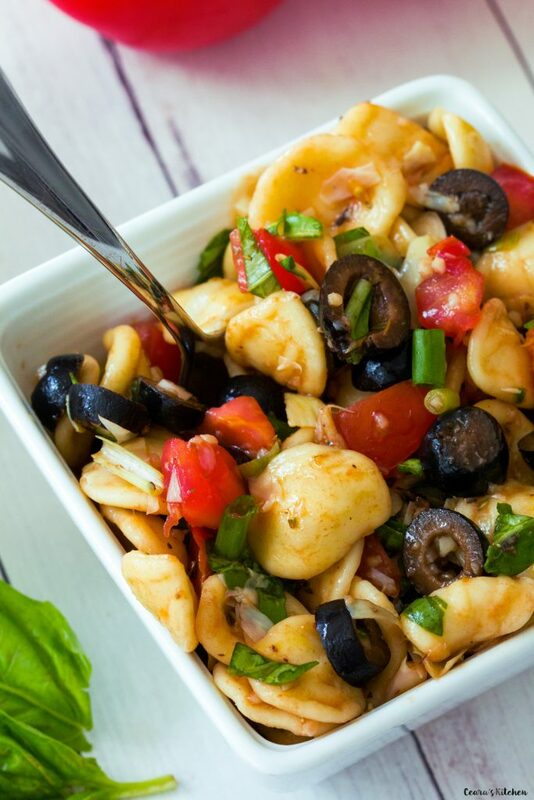 Healthy Orecchiette Pasta Salad with Basil, Olives and Tomatoes… The fresher ingredients, the better in this Pasta Salad. This is one of my favorite salads to bring to Summer cookouts and it’s always one of the first salads to disappear! The flavours taste even better the next day once the flavors have had the chance to marinate. You guys know that Summertime here at Ceara’s Kitchen is all about the salads. Salads, salads, and more salads. 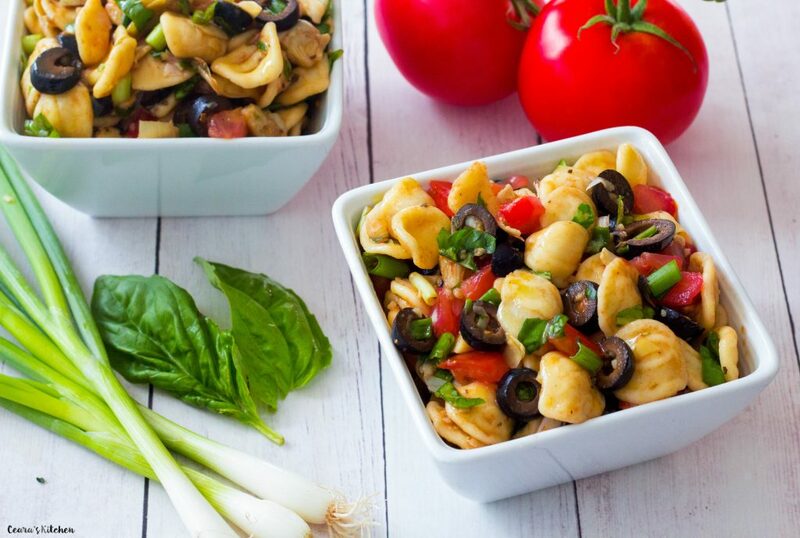 I particularly love EASY + versatile salads like this Healthy Orecchiette Pasta Salad that I can make the night before to take to a Summer cookout and enjoy the next day. And an extra plus if you can use fresh basil and tomatoes from your garden. And if you have an olive tree you can use the olives from, then I am seriously jealous. If you absolutely do not like Olives, well, leave them out of this recipe – sundried tomatoes make a good sub. And if you make this Healthy Orecchiette Pasta Salad, take a photo and tag me #CearasKitchen on Instagram or leave your feedback below. 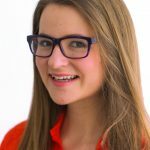 1) If you are looking for a more traditional pasta salad recipe, [url href=”https://www.cearaskitchen.com/healthy-rainbow-pasta-salad/” target=”_blank”]try this one here[/url]! [br]2) Sub the kalamata olives with sundried tomatoes. 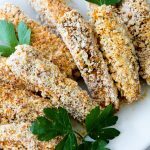 [br]3) Use Gluten Free pasta to make this recipe gluten free. [br]4) Tastes even better the next day once the flavors have had the chance to marinate. Best pasta salad ever, thanks for sharing. I can’t stop eating it! Dying to try it, but will substitute italian seasonings as our herbs de provence usually includes lavender and I am allergic to it. 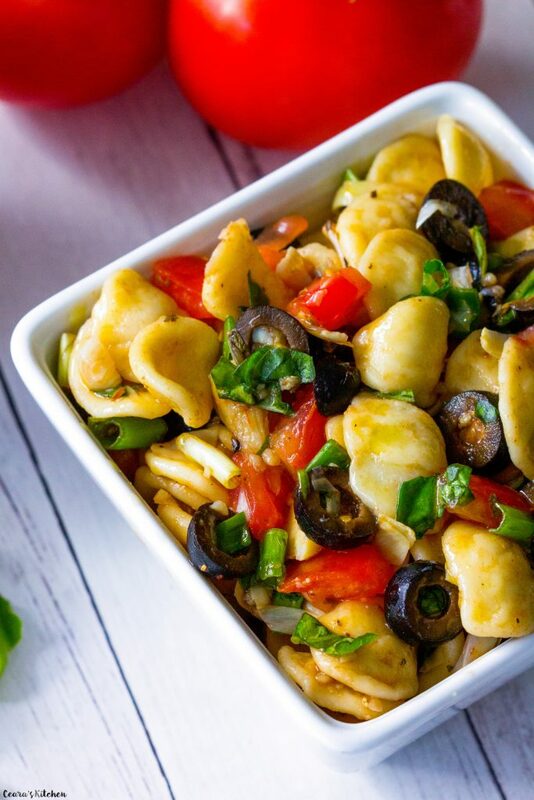 Orecchiette is one of our favorites!! Isn’t it funny how the shape can taste the flavor? It totally does for me!! This looks absolutely delicious! 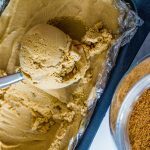 This looks like such an easy flavorful recipe! For a make-ahead lunch, I think I’ll make the dressing ahead and marinate tofu in it, too! My kind of dish! 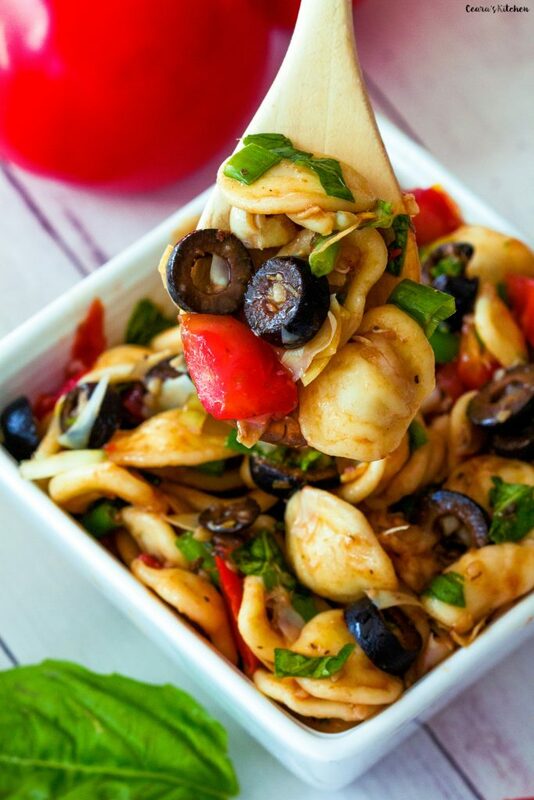 Orecchiette is my favourite kind of pasta and it looks fabulous in this salad. I love this big fat olives running through it! I love that this is oli free! Olive brine in the dressing is something I’ve never done but I bet I would LOVE it! Looks like the perfect summer get-together dish. I am the same way – I never have lunches planned. I usually always have leftovers from dinner though, so that is our go-to most often. This pasta salad looks so good! This looks like such a lovely summer supper!